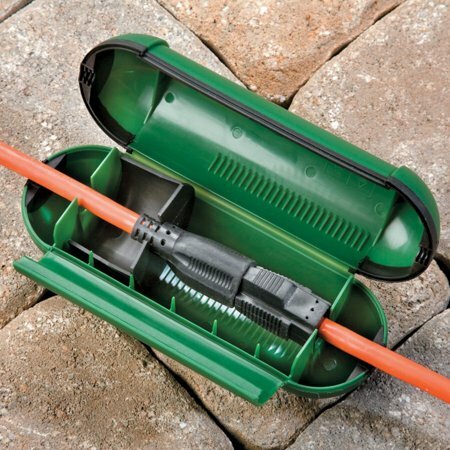 Protect outdoor electrical connections with this set of two (2) extension cord electrical plug covers. Case snaps around the point where the cords are joined. A rubber seal keeps out rain, snow, and mud when located above ground. Internal locking safety device holds cords together securely. A simple solution that will help prevent shorting out and eliminate the chore of reconnecting cords that have pulled apart. Size 8" Long x 3" Diameter.Can be used outdoors or indoors. Color: Green ( Cords not included) There are two Covers in this set. If you have any questions about this product by Safety Cord Covers, contact us by completing and submitting the form below. If you are looking for a specif part number, please include it with your message.